Tooth Whitening for Minneapolis—Because Teeth Talk! Don’t be alarmed, but the color of your teeth may be sending a flagship warning to others! Tooth whitening for Minneapolis area residents can alter other people’s perception of you. When they see someone with sparkling white teeth instead of yellowed ones it sends a subliminal message that you care for and respect yourself, therefore improving the odds others will too. The danger of drugstore-purchased whitening products is they fail to address the big picture. If you have any pre-existing oral health issues, such as untreated cavities or unhealthy gums, applying whitening agents may lead to great discomfort for you and exacerbate your issues! The American Dental Association with good reason advises the public to seek the professional guidance of a qualified dentist before using any teeth-whitening products. 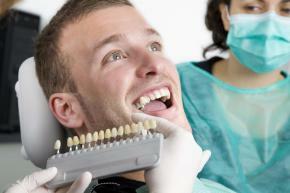 Failure to do so could cause damage to both your teeth and gums. At Serene Oaks Dental, we’ll select a whitening agent specific to your needs and ensure you get the desired results without the pain! Send the message that you care for yourself and others will too. Consult our tooth whitening experts serving Minneapolis to book an appointment today!